Get free updates of new articles, interviews & roundups here, or subscribe to our RSS feed. Web design is much more than just creating a design in Photoshop or Illustrator. Web design is about creating an optimal user experience. To make this happen there needs to be a solid connection between the web designer and the developer. It all starts with the web designer since he or she will create the actual design that the developer will convert to a WordPress theme. At PSDtoWP.net we’re front-end developers, not web designers. This means that our clients, who usually are website designers, create the web designs and we use Photoshop or Illustrator to convert those designs into fully functioning WordPress websites. In this roundup about web design tips, we want to help out all the web designers and anyone who has an interest in web design. The web design tips in this roundup are both for web designers with years of experience and for web designers who’re just starting with web design. To make sure this comprehensive list of 38 web design tips is trustworthy and reliable, we’ve asked 38 design experts to share a web-design tip that they would give to fellow designers for 2015. All the 38 web design experts are listed alphabetically. 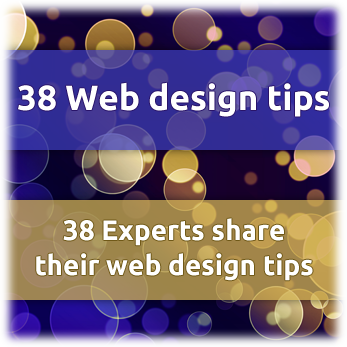 Click on a name to automatically scroll to that expert’s web design tips or just start scrolling to read all 38 tips. Below you’ll find all web design experts and their web design tips listed chronologically. Hover over a quote with your mouse to easy share their quotes on social media. Simplicity is my tip for web all designers. Being able to blend site goals, such as sale conversions, lead generation or new email subscribers with clean simple design the epitome of good design. I always want to put the users needs first with easy to read content or straight to the point navigation. Hopefully quickly and easily answer their query without overburdening the visual aesthetic of the site or bombarding them with irrelevant info. Always be improving, evolving and changing the site in search of the elusive 'perfect design'. Always keep learning. The front-end dev environment is full of new tools and tech. So stay hungry, embrace the struggle and keep learning. Try Sass. Fall in love with the command line. Node, Ruby, Git. Bower/Npm, Grunt/Gulp - all awesome and handy and the CLI is a great way to get things done quickly - and still maintain control. Follow current trends or some of them (see the list below). Use them wisely. As always, new trends must be adapted to the type of web site, to its content and purpose. If design is not adapted it will not look good and, as a consequence, it will not yield the expected result of the owner / client. Short to say; Whatever you do, keep it clean, simple and wide. Adapted too! Continue to push your abilities by learning new skills and not shying away from challenges. Also never forget that becoming a great designer or developer means learning skills and experimenting on your personal time. Lastly, if you don't have a blog, you're missing the best chance to showcase your skills. Blogging has changed my life and can change yours as well! As brands continue to place more of their energy on website design, many are focusing heavily in UX. I think that’s great, but don’t forget that UX goes far beyond your website. “User Experience” should be considered in everything you do. If you’re designing a new website in 2015, the best piece of advice I can give you is to make sure that it reflects your brand identity across the board. Take stock of every customer touch point that your brand has and make sure that you’re reflecting that experience in your website design. If you’re leading-edge and innovative, build a site that reflects that. If you’re detail-oriented, make sure you don’t cut any corners. Anyone can build a good-looking website, but building a website that truly embodies your brand will help keep your business booming well into the future. Experiment - Try different tools, learn a different program and challenge your old ways. We often get stuck in our own comfortable routines, but there are so many ways of doing things. You should make a conscience effort to try something new. You never know what you may learn! Speed and performance is to the web what typography is to design: Difficult for the average visitor to pinpoint why the experience feels so great unless they experience the frustration on the flip side. Websites in 2015 are lightweight, using nice typography and a lot of white space and padding. I could totally picture some of Android’s new design patterns being picked up by the web design community. Text will be combined with a lot of photos — mainly used as complementing background images. Furthermore websites in 2015 will provide even more additional information based on the user’s scroll position. This could be a video starting to play, or elements animating into place. Overall browsing websites will be an even richer and more interactive experience than in 2014. Command-line tools like Gulp, Bower, and Git really speed up and enhance the build process, as well as improve code quality. Using them will greatly increase your productivity as a web designer. The main issue I see people having with command line interfaces (CLIs) is they're not very comfortable with them. But there are lots of visual tutorials on the Web that will teach you how to use a CLI. For example, check out the video series about a modern command line workflow. You just have to get over the fear of the command line. Some of our industry software and web standards are more complicated than a CLI, and you were able to learn them. HTML, CSS, Photoshop, Sketch, Illustrator, etc. - they take years to master. You'll be fine on the command line™. My best piece of advice for web-designers would be to get a better understanding of user experience, processes and flows. I think web-design is not just about pushing pixels, it’s about finding solutions that can best serve your users or audience — I’m always more interested in the reasons behind a design decision, and how it affects an interface and its users, than just how it looks. Design trends come and go, some stick with us longer than others. But to me a successful UI is one that’s built with the experience and user’s goals in mind, and design decisions that are backed by solid data. Focussing on getting the flow right will be much more rewarding in the long run. You can always make things pretty later. 2015 with it brings an opportunity to capitalize on some growing trends. Not only the explosion of WordPress continues, but the specialization of themes. There are a lot of options for web designers who work with WordPress to build Online Education Websites, eCommerce websites, booking and event management sites as well. I'd encourage every designer to look for ways to leverage WordPress beyond the basic blogging site. My web design tip for designers for 2015 would just be keep it simple, in all things. From a freelance perspective this would mean just focus on what you love, focus on what you like doing, what you are good at, what makes you happy - do more of that, and in turn you will get more of that. These days on the web you can certainly feel like you have to do EVERYTHING, but our time is limited, and we have so many things that we WANT to do, it makes sense to minimize as much as possible the things we have to do but don't want to do - some things are necessary, but if you can simplify your every day to knock out things you love doing rather than struggle through things you hate doing, life will be easier for you and your clients. In terms of web design, keep it simple there too, content and usability are important - making things accessible and fast are trends that aren't going anywhere anytime soon. One of the biggest pieces of advice I give to web designers, and I think it applies here, is to really think about the order in which you design a site. For example, I never design the home page first. I design a site in the most likely order that a user is going to experience it. If they're going to land on a blog post first, I design that page as if it were the home page. If a user is most likely to land on a sales page through an ad, I design it as if it were the single most important page they'll see–because it is. It's a user-focused approach that has served me extremely well over the last few years. My advice to any web-designer in 2015 would be to take more time and consideration when thinking about the technology your website is going to be displayed on. Many designers now design from mobile upwards, as in many industries mobile usage has surpassed desktop, however desktop screens are getting bigger in size and with more pixels than ever before, therefore you need to consider the width of your desktop grid. For instance, the new Apple 5K monitor has a resolution of 5120x2880px, meaning if you stick to a 980px grid for your desktop view, your content area is only using up 1/5th of the actual screen size. So remember, mobile may come first, but don’t forget all the new retina screens that are becoming ever more popular for desktop. If 2014 was the year we have gone wild on new frameworks and libraries, perhaps 2015 can be the year where we start to be more considerate about whether to use one at all. Stacking too many frameworks and libraries on top of each other can render projects unnecessary complex, which can ultimately break more than it fixes. For developers, but even more so for end users. I think we should favour simplicity over complexity. Easier said than done, but vital if we want to create websites that work well now and in the future. Talk to end users and customers to validate your assumptions. So many designers and teams put this off because it takes time and effort to recruit, schedule and conduct these interviews. And it's easy to fall into the trap of thinking you know everything. But this is where you learn the most about the problem you're solving and is a good indicator if your design will succeed or fail. With so many DIY web builders available and the ease of installing WordPress themes, web designers need to focus on first demonstrating how their service can provide value and then providing ongoing value. This could come in the form of ongoing conversion optimisation, content creation and assistance with PR to help with getting relevant industry links. Without providing ongoing value, clients will turn to simple DIY platforms and wonder why they are having trouble building traffic. One of the most important thing to remember when designing is to always have the designs simple and responsive. User experience is a must when designing; the design should be user friendly and engaging for all ages. We all know by now that responsive websites are hear to stay and frankly are necessary to support multiple devices. Now the for front continues with a new realm of real-time communication over the web (WebRTC). As for real-time communication, this is leading the way for designers and developers to add communication features to websites to better interact with clients online. The advice that I'd give is that you have to design the whole page for usability and visual engagement. With mobile usage creating longer pages, you can't simply put a banner on top and a CTA on the bottom. More than ever you must now use form and function together and have a very clear idea of how you want a user to flow through a site. My advice would be to not follow trends blindly. Trends are not good or bad, they are trendy and often overused. Do your own thinking and judge for yourself, do you really need these flat icons, or some other will blend in better with the global design of your website? When getting started with a new project, think about creating a visual style guide. You can lay out every design element in a single page, consider how colours and typography work together, and see the whole picture in one place. There are some great resources at styleguides.io. One tip I’ve genuinely taken onboard for my own site in 2015 is to really optimise for swift loading times. As someone whose site at one point took over 10 seconds to load per page (think about that! ), getting pages below a second in load time really boosts user experience, click through rates and usability. Remove plugins that you don’t use, keep it up-to-date, get a caching system or CDN and make sure your images are compressed – if you do these things you’ll really notice the difference. Another tip - A/B web-design-tips everything! If you have a CTA that you want to emphasise, make multiple iterations using something like optinmonster or leadpages. Change the layout, the colour, the wording and run web-design-tipss to see which versions work best for your audience. In my case, a simple removal of any mention of pricing on my form raised my conversion rate from 3% to 11% - that’s pretty big. In the past couple of years responsive web design has become somewhat ubiquitous, but I think most people tend to think that responsiveness begins and ends with media queries — specifically, media queries for min- and max-width. In my opinion, going forward, this thinking needs to change. Responsiveness asserts that the website will respond to it’s environment: not just to the width of the device. Even just changing layout based on height leads to huge improvements that many websites don’t take advantage of. Detecting device capabilities such as touch to present users an experience suited for their what their device is capable of, regardless of the physical size should, and I think will play a bigger role in web design and development in the coming year. I would say to learn how to code SASS the right way. After coding vanilla CSS for a while and changing to SASS you take for granted how easy it is to nest selectors like no tomorrow, however this leads to just plain bad CSS. I would recommend thesassway.com to learn how to correctly use this awesome language. My recommendation for people who are starting now is to get off the computer, now. Designers suffer an incredible amount of overload with newsletters, tools, packages, tips, examples and a lot of information that only creates strrrreesss! Design is not about that, so take a deep breath, leave the computer, take a walk around your street and see what you would improve for other people, a sign, a pavement... It could be any simple idea, as a designer, your duty is to make that happen, so do it! Hey guys! My name is Maria, I'm a mobile & web designer, co-founder of Plainwhite, a boutique development studio based in St Pete, Russia. As we all know, IT industry changes very quickly, and not so long ago Google has announced the new Material Design guidelines, while Apple presented their Apple Watch. Both announcements met great excitement among all the designers around the world, influenced the trends in the industry and brought new experience into our routine. So, I think, that most of us will definitely be focused on the Apple Watch interface design, exploring its possibilities and trying to bring something new to the actual interface. While another interesting task is implementation of the Material Design, digging deep into animations and motion design, experimenting with transitions, morphing, bouncing etc. Pretty exciting, isn't it? And of course, follow the rules, and when you feel you know them, break them, be creative! Designing for the web and digital experiences is continually changing with new trends and technologies coming into play, but making sure you understand the basics of good communication in design is key. This is not an art project, you’re still trying to communicate to an audience/user to help them understand what to do and how to best interact with your site for a good user experience. Simplicity is really important, while striking the balance of leveraging brand, personality, animations, and other elements to enhance the enjoyment of that experience. Don't be afraid to turn down projects that are not going to compliment your portfolio / style / abilities, but accept projects that are going to put you just out of your comfort zone of knowledge, so that your skillset grows. We spend a lot of time working and taking care of our clients, so take the time to keep YOUR websites updated, and cutting edge. Keep your portfolio updated, and do not ever outsource your work. The advice I can humbly offer, is based in my own experience, where I've seen the interactive universe experience so many changes in the past 10 years. Above all be flexible, aware of the ever changing domain that is working for web and interactive products (particularly since the devices/hardware where they exist have evolved quite dramatically). Also constantly polish and improve your work methodology, collaborate and learn from others, and read articles, magazines and inspirational websites in order to understand trends, technological improvements and best practices. If you look at the Slack app, the new Balenciaga.com and Gmail.com they all follow the same pattern. The main navigation is to the left. The content is in the middle. The details are to the right. I’m beginning to become convinced that detail levels should be presented in a horizontal manner and navigation on every level is done vertically. So, for e-commerce you have the categories to the left, the product grid in the middle and the register to the right. In a messaging app you have the contacts to the left, the timeline in the middle and a filter to the right (all images in that timeline for example). Navigation is still scrolling up and down, preferable only in the middle section (content) but it could work for the side panels as well. I think this works for all kind of websites. Instead of only having a vertical navigation, with the main menu on top and the footer in the bottom. You could try to have the main menu to the right and the footer to the left. The footer could be dynamic and show related content to the middle section. This makes the footer more relevant. And information easier to degest. This only works for larger screens but that’s the direction we’re heading anyway. User experience is getting more and more relevant. The ones who decide to invest on UX and Visual Design will be the winners. I'm not talking about Digital design only, but Graphic Design, Packaging, and related areas. It's about designing experiences, not pretty and empty things, you have to tell stories and be creative on it. When designing a website it's important to remember that it should follow a cohesive design. This means that it should be easy on the eye and easy to navigate from a creative and UX point of view. From a technical point of view a great web designs should adhere to Google's guidelines in terms of site architecture, Meta Data, Rich Snippets, Content and more. So often designers tend to lean to the one or the other and both are equally important to create a share worthy-traffic-generating-conversion-journey masterpiece! When designing a website it's important to remember that it should be mobile friendly. As of the 21st of April Google will use mobile friendly site status as a ranking signal. This means that your site should be mobile ready and you can web-design-tips it on their mobile ready web-design-tipser and check webmaster tools for any messages. Developers are as integral as designers, hear them out, in regards to performance and in what's possible. Give them respect and work with them rather than telling them what to do. In 2015 we should think over why global trends are tending the flat way. Even Material design by Google revises its position and ads some before-flat-design features back. So feel free to cross the line of actual trends to make your design better. My advice for designers is to always keep learning and follow whatever topics pique your interest. The design field is growing rapidly and it’s almost impossible to keep up with every new trend. Stay focused on what most excites you about web design and don’t be afraid to push your own boundaries. Create designs that will leave behind your own perspective & a unique imprint on the design community. Reading design blogs won't help you become a better design designer. Get back to work! We hope that the tips in this web design roundup help all web designers with their future website designs. We would like to thank all web design experts who contributed to this roundup. It was great to get involved with such enthusiastic and experienced people. We’ve learned a lot from their web design tips. Please share this roundup on your website or on social media to make sure that all web designers can benefit from the web design tips in this roundup. This expert roundup has been created by PSD to WordPress. Its cool learning of these web design tips for 2015. Indeed, they are great and one should readily apply them for effectual result. From the insights and ideas of the experts, it is still necessary that we consider the customer's/visitor's user experience when designing and developing website. This should be blended with the brand goals and value-addition demanded by the end user! These are some great tips from all of these professional web designers. Some of the tips that really stood out was to always keep learning and keep the web design clean and simple with easy navigation. I believe in Steve Jobs theory to keep things simple, yet elegant. You have a website that looks awesome, but if has too many tabs and too much information, people who visit will be overloaded with information. Keep the navigation and tabs simple will allow people to pick their topic of interest faster and stay on your website longer. I also like the tip to keep learning, because the online world is constantly changing and you must adapt. Indeed, a list of very informative and amazing blogs. I have enjoyed reading it, a very perfect guide to follow. Good luck with all of your endeavors! We'll definitely use these ideas for my next web design project. Thanks! These are some great advice from the web designing experts and I really appreciate it. There are some really good tips here like how web design and development are both integral part of each other and that one should always keep learning as web designing is a constantly changing field with new ideas and technology every month. We'll send you our non-commercial newsletter a few times per year. No SPAM ever, we value your privacy.